After meeting Colin for lunch today, I headed over to the Cimitière Montparnasse to pick up where I left off on my grave picture-taking project. As I think I've already mentioned, there is a guy in Spain who sent me a request for several photos, so I planned to get the last of his requests from this cemetery today. As I was trying to locate one particular person, two "random" events happened that have me baffled to this moment. "Random Event" Number One: The Spaniard had also sent me a list of some people's graves that he couldn't locate (i.e. he didn't know what cemetery they were in). Since they all died in Paris, he figured I could check the cemeteries while I was there. While I was looking for one particularly well-hidden grave, I stumbled across the name Saul Yurkievich. As luck would have it, this is one of the people on the "can't find" list! I'm amazed to have found this proverbial needle-in-the-haystack. So, here one of the pictures of the grave. (By the way, he was a poet and a friend of Julio Cortazar's.) It's kind-of a sad grave because there really isn't a formal stone. 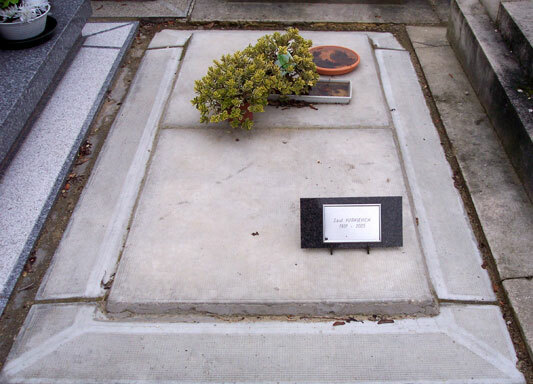 It's just a basic, minimal grave with a small plaque on it. Of course, you have to have a certain amount of money to make it into this cemetery anyway, so it's not like he's in a pauper's grave. "Random Event" Number Two: After finding the long-lost poet, I continued my quest for the elusive grave of Roger Ibáñez. Unfortunately, he's in a section that is very difficult to discern because the cemetery has filled in the allée (path) marking the north end with graves. So, I can't tell where to start counting. After a good 20 minute search, I still hadn't found him and was starting to get really annoyed. I stopped where I was and looked around with a perplexed look on my face, only to discover that there was a man walking toward me. My assumption was that this man was one of the unofficial cemetery tour guides. This is an odd cultural phenomena that I would love to explore more ... if only my French were strong enough! Basically, there are people who seem to hang out in the cemetery and look for people who appear to be searching for specific graves. When they find a lost soul, they walk up and pleasantly ask if you are searching for someone. Normally, if you're looking for a famous person, they can walk you directly to the grave. Of course, this is really helpful, but I also wonder what compells these people to spent their days tourguiding in a cemetery. Further, does this happen in other cemeteries that have a lot of famous people? I'll be curious to see if there are unofficial tour guides in Père Lachaise when I head back that way. Anyway, back to my story. A man approaches me and asks (in French) if I have a map of the cemetery. He wanted to pick one up at the gate on the way in, but the guard had stepped out. As I was digging for a cleaner copy of my map, he asked if I was searching for someone specific. I said yes, and told him who. He replied by saying that he was searching for Georges Auric. Whoa! Did he pick the right person to ask or what? I lit up and told him I knew exactly where M. Auric was, and that I would be happy to show him. (We were close by anyway.) I went on to say that my husband is studying Auric's film music, which was received with a very pleased and interested look. In response, he told me that he was the Secrétaire Général for "Les Amis de Jean Cocteau"! (Auric did all of the music, or was music director, for all of Cocteau's films.) By this point, we had reached Auric's grave, and stopped there to chat more. He asked me if I knew Auric's wife, and I assumed that he meant whether or not I knew where he wife was buried. I told him yes, that she was in the same tomb. Ah yes, he recalled, the first wife. What he was really asking was whether we knew Michelle Auric, his widow. "Non, I said. "Et vous?" "Oui." Sure, you can call this chance. You can call it luck. Call it dumb luck, even. I say it was divine intervention! I truly believe that everything (good, bad, or otherwise) happens for a reason, and as such, this is the precise reason that I "randomly" decided to start photographing Cimitière Montparnasse. On a different note, I plan to announce the winners of the e-mail contest tomorrow. So, if you still want to enter, there is a little bit more time! Let me know what's going on in your life!! What an amazing story Amy!! What are the odds?? Wow! I bet Colin was floored when you told him! That's awesome. By the by, in answer to your guess, Henry VIII beheaded only two wives. Everyone here at my work guessed about the same number that you did! You lead such an exciting life! I get so jealous when I read your blog :)!! But I can't complain ... my hubby is taking me to Tuscany for our 5-year anniversary! So we're pretty excited! It's a walking tour where you visit all the winerys. YUM! Incredible! I've thought all along that if you could just find some way to contact the second Mrs. Auric, she would be favorably impressed with your sincere interest in her husband, and that she might be willing to talk to Colin because of that. And to think that when the contact happened, it was in person! Amy, this shows that you and Colin are truly a team in his work. We can't wait for the next chapter in the story. I swear, child-of-mine, you cold fall into mud and come out "lookin' good."